CSS helps Ahmed Kemal find a summer research experience worth writing home about. By almost any measure — geographically, culturally, even meteorologically — Addis Ababa, Ethiopia and Duluth, Minn., are polar opposites. But Ahmed Kemal,'15, is slowly bridging that gap. For the past two summers he has given Duluthians a small glimpse into his native Ethiopia, serving as the translator for two Ethiopian winners of Grandma's Marathon, Berhanu Girma (2012) and Bazu Worku (2013). Now he's working on bringing a little bit of Duluth to Ethiopia. "In Ethiopia, pharmacists are really underutilized, which leads to more medication errors, improper administration and costly delays," Kemal said. "So my goal is to become a pharmacist here and, after gaining enough experience, go back to Ethiopia, open up my own pharmacy and be part of the solution." And with his experience this summer, he's one step closer to doing just that. After three years as a biology and biochemistry major at CSS, Kemal has already built an impressive academic resume. But this past spring, he was looking to add to it. Kemal identified a few research opportunities for the summer and connected with Mary Anderson in Career Services. Together, they worked on Kemal's resume, personal statement and all other application materials. The teamwork paid off. 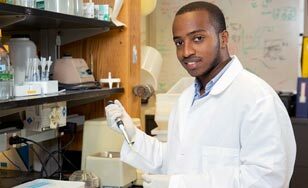 Kemal earned a summer research position in the pharmacology department of University of Michigan. And he was ready to hit the ground running. "At CSS, I worked with my professor, Dr. Paul Stein, on protein binding research ," Kemal said. "I was able to apply a lot of the techniques I learned from him in Michigan, which put me in a better position to transition smoothly." In Michigan, Kemal spent his days studying opioids — drugs such as morphine, codeine and other prescription painkillers. And while these drugs are useful, they carry heavy side effects, with tolerance and dependence being the most alarming. Opiates take action when they bind with opiate receptors in the brain and spinal cord. Kemal and the other researchers performed experiments to learn more about how these receptors work in order to discover how opioids can be altered to lessen these side effects. "This pharmacology study goes hand-in-hand with what I want to do," Kemal said. "Being around these great scientists and seeing how they work — how they actually study the drugs and fine tune their molecular structure to create the desired outcome — makes me want to dedicate myself to becoming a better pharmacist." A commitment that may someday make Ethiopia a little healthier place. "All the faculty and staff really prepared me well for this opportunity — it all happened because of their help. It's like the whole school was behind me ." See what research opportunities you can find at CSS and other institutions.